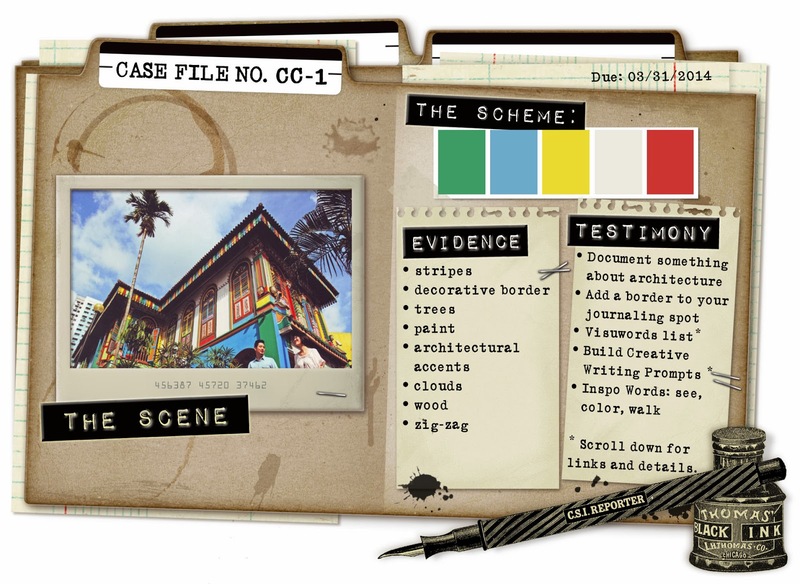 I am back again with another CSI collaboration and this time it is with Archi-Scraps and you can find all the details on how to enter this challenge HERE. 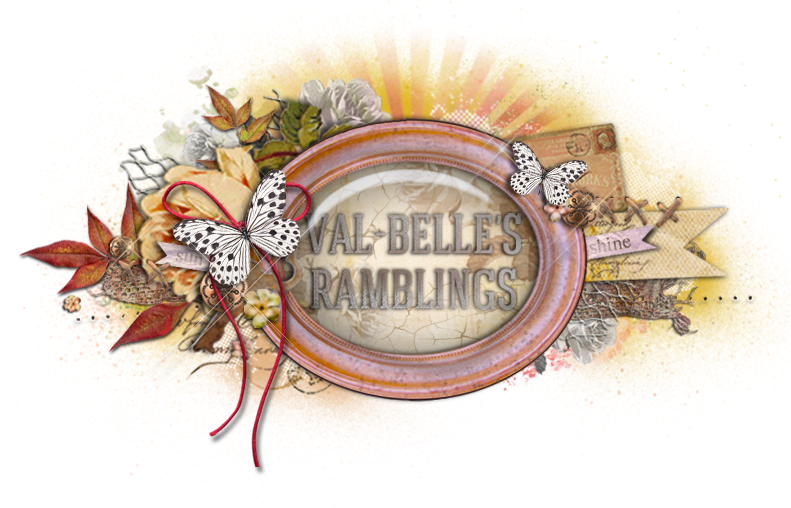 Debbi Tehrani from CSI has come up with a gorgeous fun case file for this collaboration. I used this sketch from Scrap Friends and you can find the details for this challenge HERE. And... here is my layout. Scheme - All the colours are there. Evidence - Stripes, decorative border, paint, clouds and ziz-zag. Testimony - Document something about architecture, IW - See colour and walk. There are few things that I love more than taking my camera and wandering around. No place to go and nothing in particular to do but take it all in. I took these photos last year in Cape Town. Simon had gone down on business and I went with him. We were in one of the outlying towns and I was walking around admiring all the old Cape Dutch houses with their broekie lace trims and wrap around verandahs, when I turned the corner and caught a glimpse of something that literally took my breath away. Although it was winter the sky was a beautiful blue and the sun was shining bathing this lovely grey and white church in its weak afternoon light, on either side it was framed by a red bottle brush and a beautiful bougainvillea and it was so lovely. The vivid colours and the lovely lines of the church were just mesmerizing. I am always very happy when I look at my photos and I have managed to capture exactly what I had seen. I started with a beige piece of cardstock and I laid down some strips of washi, builders and masking tape in a criss-cross pattern. I covered it with a layer of gesso and added the stencilled chevrons down the side and across the bottom. Once the gesso was dry I added my colour using gelatos, smudged it in and then used a wet brush to move the colour around until I was happy. Once this was dry I added the paint splatters and then drew in clouds and filled them with gesso and again left it to dry. I added some torn washi tape to the edges of the layout and also to the criss-cross section where the paint is. I then created the mat for the photos and put it all together. I had fussy cut the poppies from some left over paper I had and added micro beads to their centers. I drew in the circles, around some of the chevrons and aound the clouds and added my quote by hand. A biggie for me, because I don't like my handwriting. I tucked in the little yellow flowers and added the title. I decided I was just going to have fun with this one and I did. Such a great quote to use Val. Very clever. Photography is a terrific hobby. Thanks for joining in at Archi-scraps. This is so beautiful and yet so fun! ....second thoughts, you're ROCKING the MM LOs too!!! Versatile you! Those photos are supberb.....& these colours...I've gotta photograph my CSI today...LOOOOOVEd this case file....great take for Scrap Friends, too....those chevrons...YUM!! Val, this is just such a fun piece! What really pops is the blue in your photographs! Love it! This is so lovely! Love the subtle chevron on the edges and your gorgeous red flowers mixed with your layers. Gorgeous! Thank you for joining us at ScrapFriends/kreative koncepts. Striking page. Great take on the sketch. Like this so much Val. Thanks for joining in at Archiscraps. Love your take on the sketch from Kreative Koncepts (Scrap Friends) and the colours look fabulous. Such a vibrant page - love it. Thanks for joining us in our CSI/Archi collaboration. What a marvellous page Val, love the use of that terrific sketch with your gorgeous photos & brilliant embellies! Thank you for playing along with us at Archiscraps in this collaboration with CSI. Beautifully done! I love the bright pops of color! 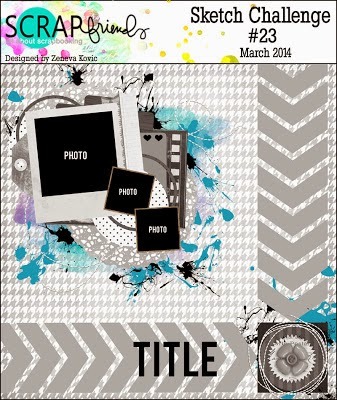 Thank you for joining along with ScrapFriends/Kreative Koncepts!